- http://www.china-defense-mashup.com/wp-content/uploads/2008/12/david-petraeus-l-command.jpg (Set of four military flags which seem to be judging from their colors, the following (from left to right): Yemeni Air Force (coat of arms: http://www.scramble.nl/mil/4/yemen/gfx/yaflogo.gif on a light blue horizontal background), Yemeni Navy (dark blue), Republic of Yemen Yemeni Army (crimsom red). Source: http://www.china-defense-mashup.com/yemen-wants-deeper-cooperation-with-china.html (picture taken on December 14, 2008). 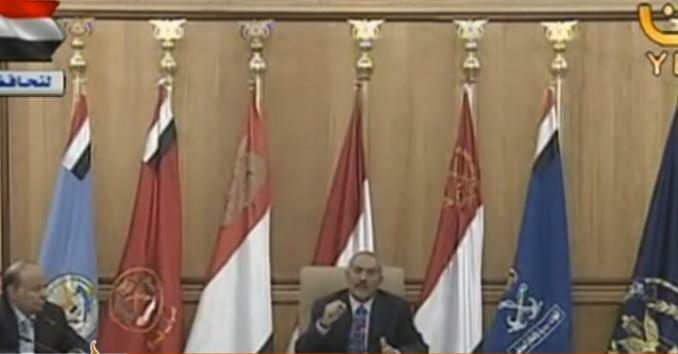 Here's another screenshot of an Al-Jazeera news channel broadcast in English taken on March 22. Row of seven flags, most of them military-related. 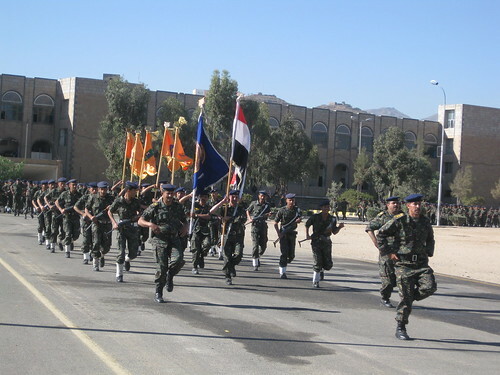 From left to right: UFE 1 (probably Air Force flag), UFE 2 (probably Army flag), UFE 3 (probably State Flag, with Coat of Arms in golden colors), UFE 4 (most likely country flag), UFE 5 (probably Republican Guard flag), UFE 6 (probably Navy flag) and UFE 7 (probably Minister of Defence or Military Forces flag). - Yemen Republican Guard (الحرس الجمهوري اليمني) (Arabic Wikipedia article) (featuring the coat of arms) .